Haleakala National Park in Maui. 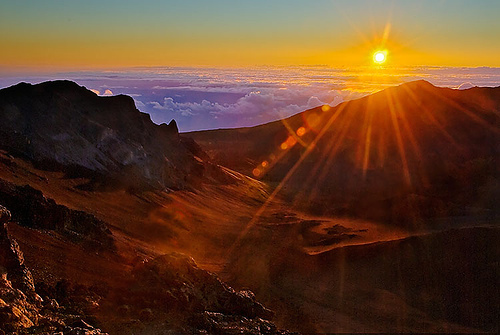 Haleakala National Park, or the “house of the sun,” is home to endangered species, volcanic landscapes and sub-tropical rainforests filled with secluded hiking trails that lead visitors through this exotic location. Hikers can bring a picnic breakfast and hunker down for the colorful display of light that spreads across the valley. It can be chilly, sometimes below freezing, before sunrise at the top of this 10,023-foot dormant volcano, so prepare with plenty of layers. Sunscreen is also recommended if you plan to stick around for a hike through the volcanic landscape. There is no food, beverages or gasoline in the park, so be prepared. If the volcano isn’t of much interest, the coast is a beautiful spot as well. Puu Ualakaa State Park on Oahu. A one-mile loop trail leads to a lookout at Puu Ualakaa State Park where visitors can view southern Oahu. This spot is known for romantic sunset picnics while onlookers admire the views of Diamond Head and Pearl Harbor. 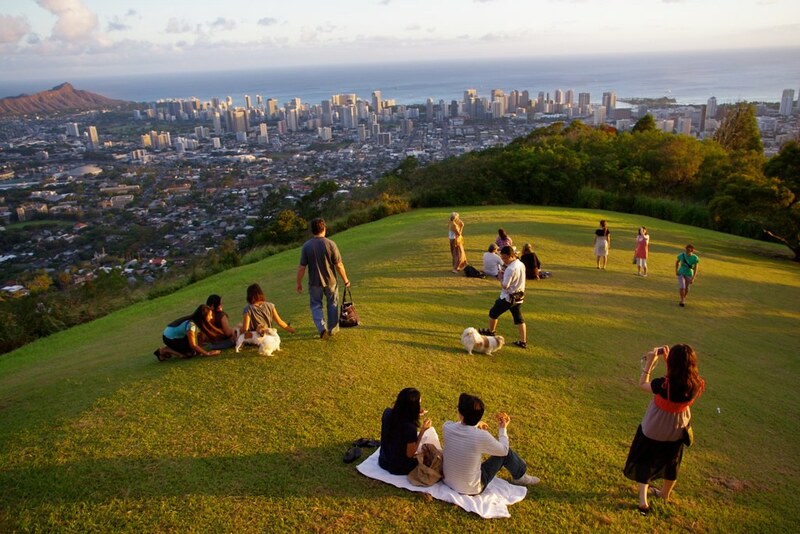 Even Honolulu and Monoa Valley can be seen from this height, which sits on top of a cinder cone near downtown Honolulu.The trail leads through a wooded area, and the leisurely walk will take visitors up to the top of the hill that overlooks the city below. Let the backdrop of the forest and the bustling city be the perfect, romantic sunset location. Kailua Kona Coast on the Big Island. This seaside town on the coast of Kona is an ideal spot to watch the sunset. A historic fishing village, this coast is now a destination for shopping, restaurants, and those who want to get away from the bustle of life. The Na Pali Coast of Kauai. One of the most beautiful places in the world, the Na Pali Coast of Kauai is home to waterfalls, beautiful green mountains, and a breathtaking coastline. The pali, or cliffs, are a backdrop of rugged valleys that suddenly end once they reach the ocean. The valleys are dotted with waterfalls and streams that continue to cut into the terrain. Stone terraces where Hawaiians once lived can still be found on extensive hikes. A large state park here is made up of these beautiful landscapes for all to enjoy. Many plants that once thrived on the island are considered endangered. Because of that, there are no roads in this area. 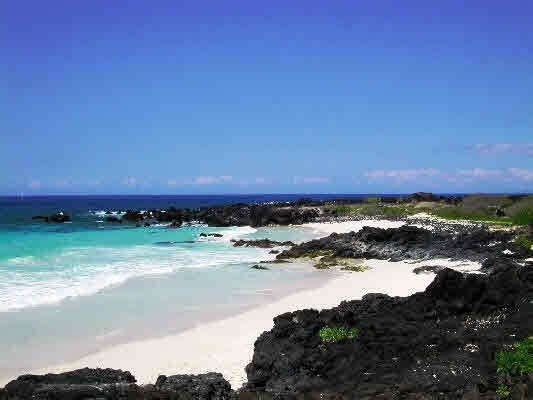 Maniniowali Beach at Kua Bay on the Big Island. Watch out for powerful waves in this location, but be ready to be swept away by the beautiful views of the ocean and romantic atmosphere. The drive to the beach, once only accessible by a dirt path, was paved in recent years. While it’s easier to get to, it’s still not widely known and can provide a quiet, secluded location. Sit on the lava rocks and keep an eye out for turtle and dolphin sightings, a common occurrence at this spot. Packing a picnic lunch is also a good idea. Recently installed showers and bathrooms near the parking lot make it easy to spend a few hours on the beach. Home to condos and resorts, Sugar Beach, also known as Kealia Beach, is said to be one of the longest beaches in Maui. 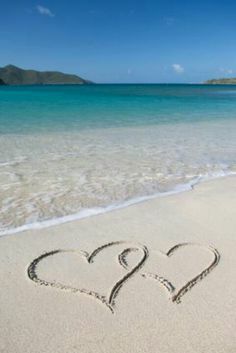 You won’t find any buildings on this beach, making it a perfect spot for romance. It can be a bit windy here, though, so it’s a favorite spot for kite flying and kayakers that often push off from the shore. Duffy Waldorf Wins First Event on PGA Tour Champions in Dramatic Fashion! 53-year-old Duffy Waldorf shot a 6 under 66 to finish at 18 under par at the Mitsubishi Electric Championship at Hualālai Golf Club. Not only was it Waldorf’s first appearance here, but he managed to play all 54 holes without a single bogey. It was an incredible week with a stellar field. Veteran Tom Watson made headlines Friday afternoon after bettering his age of 66, shooting 7 under 65 to be two behind Waldorf going into final round Saturday. In fact, a total of 9 players were within 3 shots of the lead entering the final round. The entire field seemed to be playing exceptional golf, but Tom Lehman and Duffy Waldorf’s match was one for the books. Both players amazingly kept their composure all the way into the final holes. It started with a clutch putt made by Lehman to save par on the 15th hole to keep his 1-shot lead over Duffy. Waldorf however didn’t falter and dropped a nice looking birdie putt on No. 16 which would result in a tie. Waldorf had a small error when he overshot the 17th green, but Lehman only had the advantage for a couple of minutes before Waldorf made his clutch 7 footer again tying Lehman heading into 18. The two hit beautiful approaches into the green, landing 25 and 30 feet away. Duffy, being away, managed to drain his long putt to put the pressure on Lehman. Lehman couldn’t comply as his ball stopped just a few inches short of the hole. Lehman closed with a solid 66, but couldn’t match the play by Duffy Waldorf. "I knew I was playing well, but this is a strong field," Waldorf said. "Even starting the day, I'm like, 'If I play well there's a good chance I won't win.' So I really didn't feel any pressure out there that I had a chance to win or was going to do well, just wanted to play as good a round as I could." This is Waldorf’s second victory in his last three starts, winning the Toshiba Classic last November, his first senior title. If you and your family are planning a golf trip to the islands or would like to learn more about courses in Hawaii. . . The 2016 Mitsubishi Electric Championship begins today and will run until January 23, with a distinctive Saturday finish. The Championship will be held at the Jack Nicklaus designed Hualālai Golf Club on the Big Island of Hawai‘i for the 20th consecutive year, the second longest of any event at a single course on the PGA TOUR Champions. Defending champion Miguel Ángel Jiménez will be teeing it up this afternoon along with other notables such as: Freddie Couples, Paul Goydos, Bernhard Langer, Corey Pavin and Vijay Singh, just to name a few. Broadcast coverage will start this afternoon on Golf Channel at 2:00 p.m. - 5:00 p.m. (Hawaii Time) and continue each day at 2:00 p.m. until Final Round Saturday. …So for other exquisite Big Island courses and lava golf click the link below! Hawaii Tee Times would like to wish our local friend Michelle Wie the best of luck at the 2015 U.S. Women's Open which starts tomorrow, July 9th, at Lancaster Country Club, in Lancaster, Pennsylvania! Michelle will be defending her title as the 2014 U.S. Women's Open winner! Good Luck Michelle from all of us at HTT!! If you're in Hawaii on our Nations Birthday we have compiled a list of firework shows for you that you could attend after that successful day of Golf!